Kublai Khan (1215-1294) was a Mongolian leader who made an impact on China, not only through conquest, but also by ruling successfully. Many of the rulers before him were brutally land-hungry and apathetic to the conquered people; however, Kublai challenged the stereotypes of Mongolian rulers by investing in his newly acquired people and providing the foundations of a grand empire. Unfortunately, after turning from his nomadic heritage and adopting Chinese manners, his Mongolian government failed to remain in control and was eventually overthrown by the Chinese. 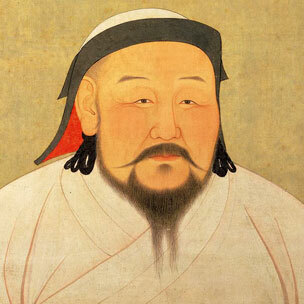 Kublai Khan was the son of Toluia and Sorghaghtani Beki and the grandson of the famous Genghis Khan. Kublais mother not only raised him and his three brothers after their fathers death, but was also responsible for reclaiming the throne for her sons after losing it to Toluias brother. When the eldest son Mongke gained the throne, Kublai, the next in line, showed his own military strength and was given great responsibilities. After a religious battle between Buddhists and Taoists led to the death of Mongke, Kublai was given the throne. However, Kublaiís younger brother, Arigh Boki, with the help of support of several Mongols, challenged the throne. Kublai won over Boki when he cut off supplies to the southern empire. Kublai was claimed "Great Khan" in the North in 1260. Kublai developed a new type of control by surrounding himself with a variety of religious advisors. He showed tolerance towards the religions of his new subjects and because of his leniency, a relationship formed between him and his people. Kublai Khan's transformation from conqueror to ruler led to many developments in Chinese culture. Along with providing religious freedom, he created aid agencies, increased the use of postal stations, established paper currency, reorganized and improved roads, and expanded waterways. Under his rule, the winter capitol was moved from Mongolian territory to the Chinese City of Dadu, which is modern day Beijing. He established the summer capitol in Shangdu, which was referred to as Xanadu. In 1275, Marco Polo, a Venetian explorer, visited Xanadu and a relationship of trust was formed between the two. Polos reports on Xanadu and China were new to Western Europeans and sparked further interest in eastern world exploration. The Yuan Dynasty failed, unfortunately, with the death of Kublai Khan due to many factors. Kublais decision to move the capitol to Chinese territory and to install his lavish palace at Xanadu offended his Mongolian advisors. He was torn between establishing a stable country and following the traditional nomadic ways of his people. Kublai was eventually synicized and his Mongolian influenced government battled between their ways and the demands of the Chinese. The division in the government and frustrations of the Chinese people were not the only reasons for his downfall. Kublai sought expansionism to appease his frustrated Mongolian advisors and sought after Java and Japan. His attempts failed and cost his government extensive amounts of money. The paper currency he created caused inflation and continual conflicts between disgruntled religious groups arose in the mixed society he fostered. In 1281, the deaths of Kublais favorite wife and the thrones next heir sent him into depression. Consequently, with a declining government in his hands and an ache in his heart, Kublai became an obese drunkard and died at the age of 79. Regardless of Kublai Khans demise, the Yuan Dynasty made a lasting impact on China and established the legacy of The Great Khan.